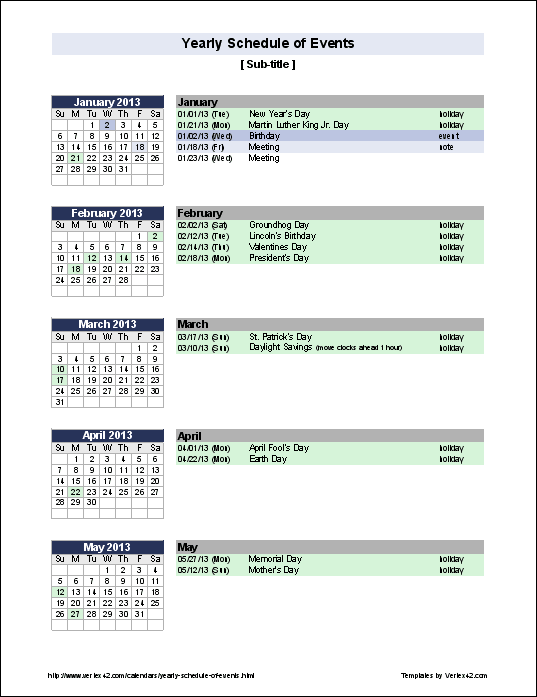 Schools, clubs, businesses, or other organizations that want to create and publish a yearly schedule of events can use this template to list dates and event descriptions with the dates highlighted on mini monthly calendars. 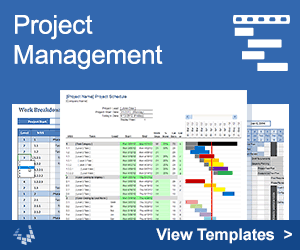 The schedule can then be converted to a PDF to be shared with others. Unlike many of my other yearly calendars that just display dates, this template lets you list short descriptions of events. This is a popular format for schools, clubs, and other organizations. Event Types (optional): In the XLSX version (for Excel 2007 or later) you can define up to 7 different types of events to highlight with different colors. In the XLS version (for Excel 2003), you can define up to 3. Conditional Formatting: This template uses conditional formatting to highlight event dates in the mini calendars. You can still highlight cells by formatting the cells manually (such as graying out the weekends). See the Help Worksheet: Some getting-started instructions and information about printing are included in the Help worksheet within the template. Publishing Your Schedule of Events: Although Vertex42.com does not permit publishing this spreadsheet on the web, you may create a PDF and publish the PDF if attribution is given. Conditional Formatting: The dates in the mini calendars can be highlighted by choosing an event type in column L. This is done via Conditional Formatting (see the help in Excel on that topic). If you don't want the events in columns J-L to be highlighted, you can remove the conditional formatting conditions for those cells. Adding More Events - In this template, it is very easy to add more events if you run out of rows for a particular month. Just select the row (the entire row) marked "Insert new rows above this one" and right-click on the row number and select Insert. Events Spanning Multiple Days: If you have an event that lasts more than 1 day and want to highlight the entire span in the mini calendar, the template does not do that automatically. One option is to enter the start date for the event, and then specify the duration in the event description. You can still edit the background color of the cells manually if you want to, keeping in mind that the conditional formatting will trump (override) any manual formatting. School Calendars: This template is actually a modification of my school event calendar. In the Schedule of Events template above I've added the ability to specify an event type to highlight different types of events different colors.